It’s my personal Yelo mod. Originally, Yelo mod was invented by Tek, an old inactive penmodder (very active in 2008-2009 on UPSB). Yelo mod stuff is hard to get these days : 1 yellow bellcolor barrel, 2 yellow donga caps, 2 hgr tips, 2 impact rt tips, 2 yellow metallic gel grips. On my personal version, I only have changed grips : I’ve used Airblanc grips, yellow orings and Yellow Anyball. By the way, I am glad with the results about anyball grips shape. 21.5cm for 17 grams for mine. If you want to know the exact tutorial, feel free to ask me. If you are enough, I will make a video about it. It’s been a while I didn’t post here, so sorry. I was very busy in my life, and my photoshop software was dead recently. But Today I have plenty of new mods to show you ! Let’s start with this one. 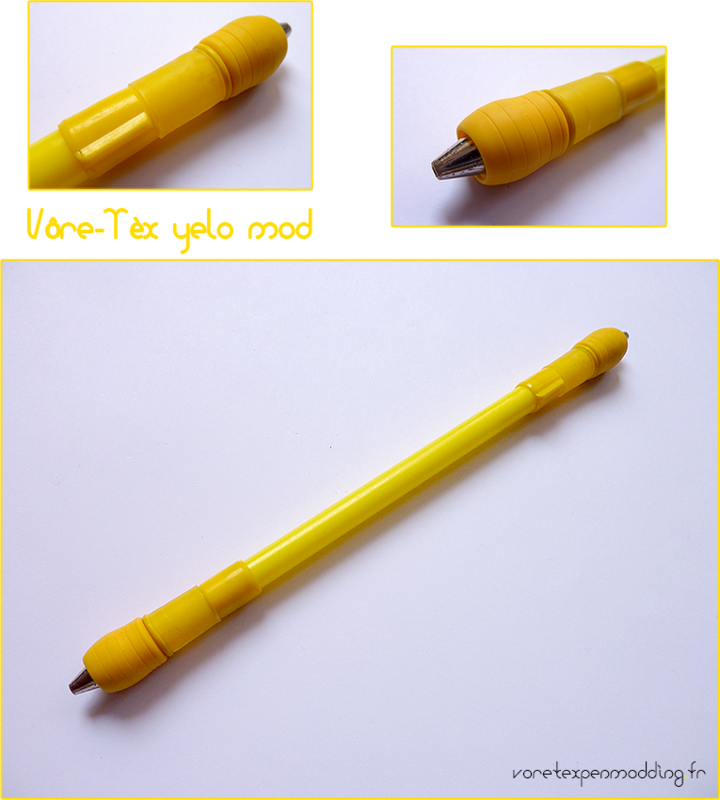 Share the post "Vôre-Tèx Yelo mod"